The world’s first self-flying taxi was launched at the Jumeirah Beach Park in Dubai, United Arab Emirates today. The Autonomous Air Taxi (AAT) of Dubai was the brainchild of Dubai’s Road and Transport Authority (RTA). The AAT, expected to be put into use in the fourth quarter, is powered by electricity and is highly safe. Its design comprises 18 rotors to ensure secure cruising and landing in case of any rotor failure, said RTA. “It is environment-friendly as it is powered by clean electricity, and it has very little noise. It has a maximum flight time of approximately 30 minutes at a speed of 50 km per hour, and a maximum air speed of 100 km per hour,” according to RTA. 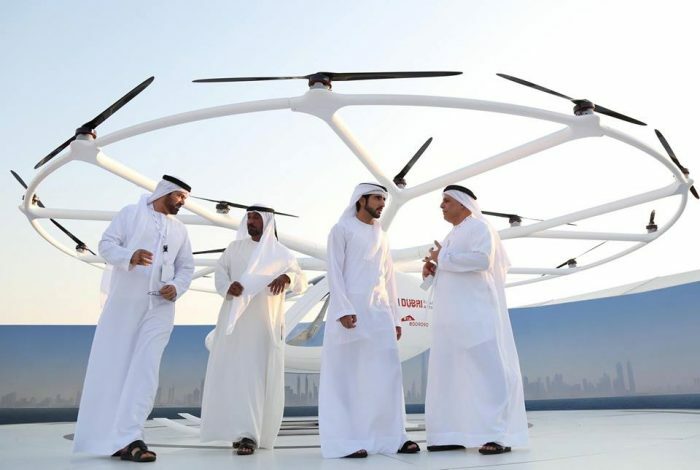 “After the remarkable success of the first driverless metro in the region, we are glad to witness today the test flight of the Autonomous Air Taxi,” said Crown Prince of Dubai Sheikh Hamdan bin Mohammed Bin Rashid Al-Maktoum. “This is another proof of our commitment to positive change. We are constantly exploring opportunities to serve the community and advance the prosperity and happiness of society,” he added.